Hi, I am Tia Ruth and I’m a Chocoholic. I absolutely love the stuff. But I am particular about it too. I like my chocolate unadulterated. Of course there are exceptions; there are some Mexican bonbons with tequila that are good. I’ve had chocolate filled with champagne and that was good too. And then there is beer cake. LOVE IT, and so does everyone else that tries it. I made the cake this weekend to be auctioned off for Relay for Life. Hopefully it will bring in mucho dinero. 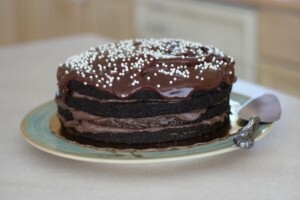 For those of you allergic to watching PBS and/or Create, this pictorial of the steps to make this cake are for you. 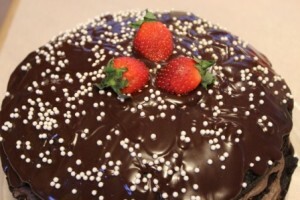 Always make the cake first, then the glaze, and finally make the filling. You really want both the cake to cool completely and the glaze to cool off before you put the cake together. I have found that it works better if the glaze has had a chance to thicken before you pour it over cake or it will end up in a chocolate lake. I learned this the hard way! 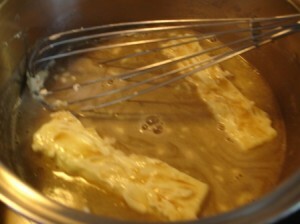 I even put the glaze in the fridge for a while to make sure it is thickened and cooled off. The glaze does harden so if it becomes too hard to pour, warm it up a little just to make it easier to pour and still have control over it. 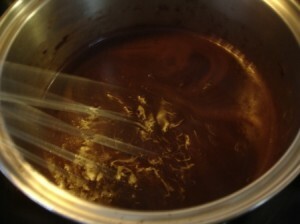 Melt the butter, add the beer (I use Guinness Stout) and bring to a simmer. 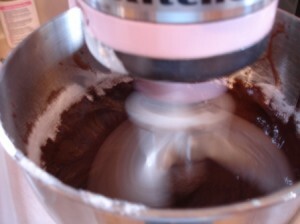 Add the Dutch chocolate, mix until smooth and let it cool. 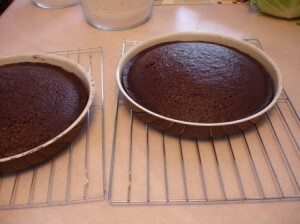 While you wait for the cake and the glaze to cool, you can prepare your baking pan. 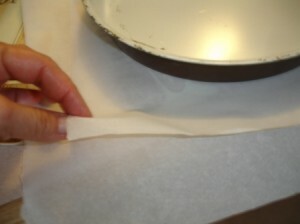 Stack two pieces of parchment paper together. 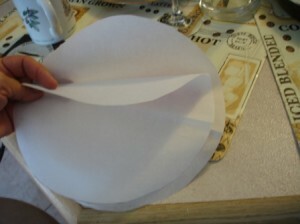 Place the cake pan on top and using a pencil, trace the BOTTOM of the pan on the parchment paper. 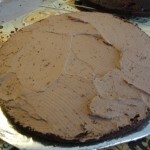 The cut around the tracing, but stay on the inside of the line so that the lead does not end up on the cake. You end up with two perfect circles that fit the bottom of the pan exactly. 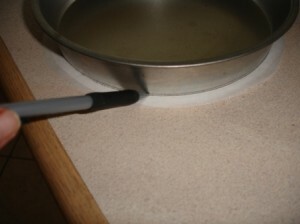 Butter the pan (including the sides) and then put the parchment paper on the bottom of the pan. Butter the parchment paper too. I have a silicone brush from the dollar store that does the trick beautifully, or you can just use a paper towel that you dip in the butter and use it to spread the butter around. Turn on the oven and set it to the required temperature. 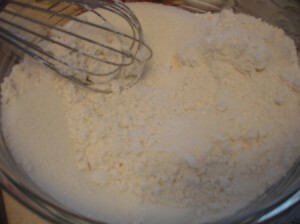 Mix all the dry ingredients for the cake together. 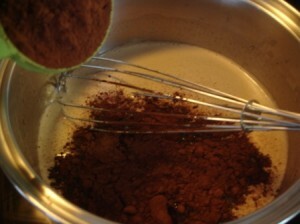 A whisk is good for this because it mixes all the ingredients well and it breaks up any clumps. 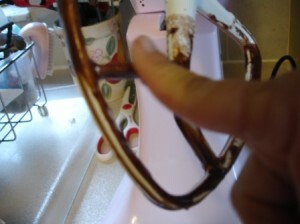 Don’t forget to lick the spoon when you are done mixing. 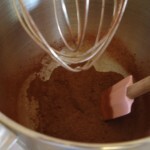 Pour the mixture split evenly between the two pans. Cool in the pan for a few minutes, remove the cake from pan and let cool completely. REMEMBER take off the parchment paper that is stuck on the bottom of each cake. It is hard to cut through and not pleasant to eat. 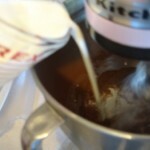 While the cake is baking, you can make the glaze. 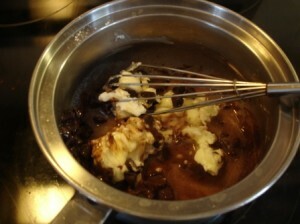 Simply mix the butter and chocolate until the chocolate melts, then adding the corn syrup at the end. Keep this in the pan. That way if you need to warm up the glaze, it is simple. Be careful you don’t overheat it. Now comes the hard part. Each cake has to be cut in half. I’ve tried two different ways to cut the cake. 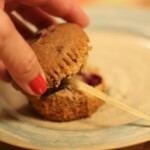 Use a fishing line or dental floss to pull through the cake. Set the line on the middle distance between the top and the bottom of the cake and gently, pulling on both sides of the line. As you pull through the cake, make sure each end of the line is maintained in the middle distance. Pull all the way through using a slight sawing motion. 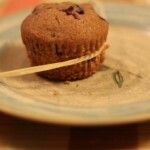 I’ve used a cupcake as an example, and a thick piece of cord. 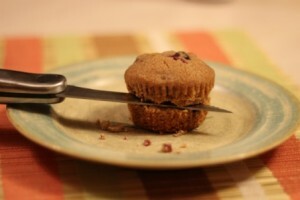 Or you can use a serrated bread knife to cut through the cake. The trick is to keep turning the cake as you cut. Maintaining the middle distance between the top and the bottom of the cake and keeping the knife as much through the cake as possible, using the part already cut to keep the knife in place. Keep cutting until it is cut all the way through. Now you can make the filling. 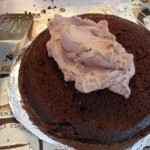 The filling is whipped cream so it works best if it is cold. 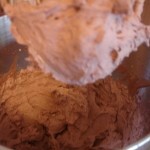 Add the dry ingredients to the mixing bowl and mix well, add the cream and whip until you get the peaks. Don’t think you can beat it forever, if you do, you will eventually get chocolate butter. But it will take a few minutes to fluff up into this wonderful whipped cream. I suggest you lick this spoon too! My cakes usually have a dome on top. So I end up cutting the top off of one of the cakes so it does not topple over. This thin layer is excellent for quality control. Eat this piece to make sure the cake is good. (It has NEVER come out bad only crooked.) This is the cake I use on the bottom. So keep the cake with the prettiest top for the top layer. You will now have 4 layers of cake. Separate the layers of both cakes. If the layer breaks into a couple of pieces, just put the puzzle together, no one will be able to tell if it is one piece or three pieces once you use the filling and add the glaze. Take 1/3 of the whipped cream and put it on top of that bottom piece, spread it out, put that top layer (the one you flattened out by cutting the top) on top of the layer of whipped cream. You don’t have to bee too careful when adding the whipped cream, I try to go just to the edge because the weight of the next layer pushes it out and makes it look pretty. Then add the next 1/3 of the whipped cream to the top of that cake. 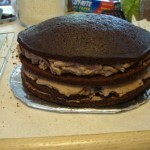 Then place the bottom half of the pretty cake on top. Add the last third of whipped cream and you end up with 4 cake layers and 3 whipped cream layers, like the picture above on the right. See how pretty that is? And the top has the perfect dome shape. Of course you could have cut that top off too and made it flat if you want to do more quality control tasting. Take the glaze and gently pour or spoon over the top. 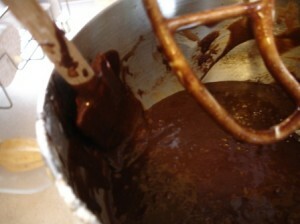 The glaze will drip down the sides and add character to the cake. You can put sprinkles, fruit, M&M’s or nothing on top of the glaze. And it is ready to eat! hmmmmm. Let me know how it turns out when you make it. I do not even know the way I stopped up here, however I thought this put up was once great. I don’t recognize who you might be however definitely you’re going to a famous blogger if you happen to aren’t already. Cheers! 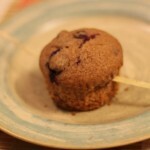 Hello very nice blog!! Man .. Beautiful .. Wonderful .. I’ll bookmark your site and take the feeds also?I am satisfied to find a lot of useful information here in the put up, we want work out more techniques on this regard, thanks for sharing. . . . . .
I’m definitely glad I stumbled upon it and I’ll be bookmarking and checking back frequently!